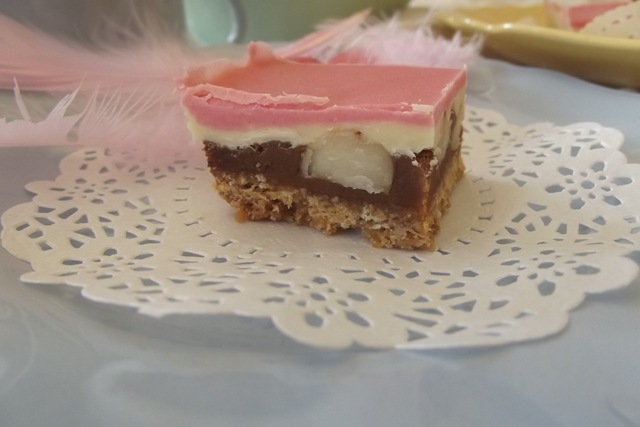 This slice as I said does take a little extra time, but the results are wonderful, and your slice will be perfect bite size pieces of sweetened bliss. Preheat oven to 180° C. Grease 20cm x 30cm lamington pan, line with baking paper 5cm ( 2 inches) over long sides. Sift flours and sugar into a bowl, add coconut and melted butter, mix well; press into pan and bake for 15 minutes. Wait until the biscuit base is cooked before starting the caramel filling. Start on the Caramel: Stir condensed milk, extra butter and treacle in a small saucepan over a medium heat until the caramel is golden brown, about 15 minutes. Working quickly, pour caramel over the biscuit base; smooth with a spatula. Press nuts into caramel with spatula. Bake for 10 minutes; cool. Stir half the white chocolate and oil in a small saucepan over low heat until melted smooth. Pour white chocolate over caramel. Refrigerate for 30 minutes. 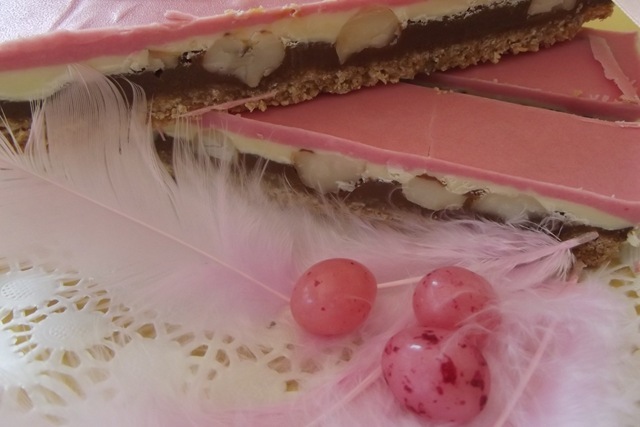 Stir remaining white chocolate and remaining half of oil into small saucepan over low heat until melted smooth;tint with pink food colouring. 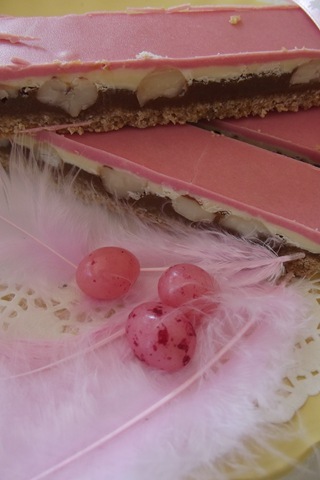 Pour pink chocolate over the white chocolate. Refrigerate for 2 hours before serving. Before cutting this slice, leave it stand at room temperature for at least 30 minutes before cutting into squares. 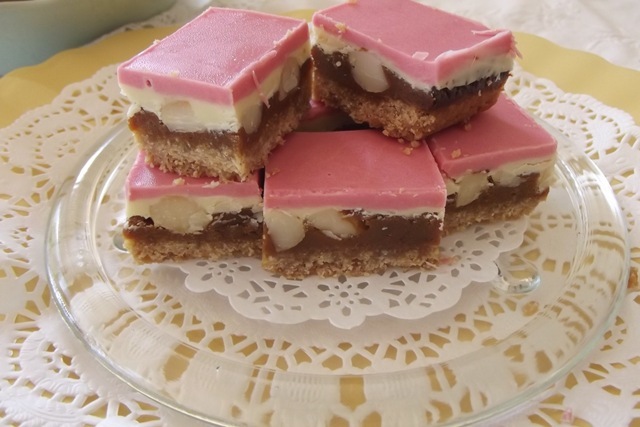 Caramel slice can be stored, refrigerated in an airtight container , for up to 4 days. My friends it won’t last that long! 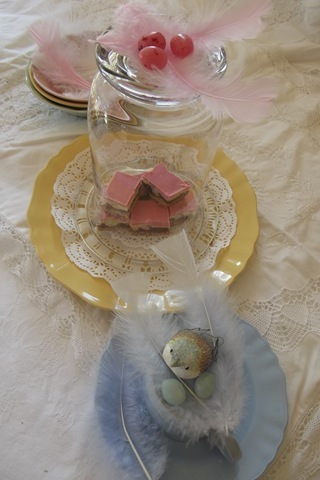 …a few feathers, eggs and little birds for a special Easter treat. Wow how creative, so pretty and tempting. I love your ideas! These are so pretty Yvette! You always photograph everything with such love and so much attention to detail! Lovely recipe! These are very pretty, Yvette, and sound delicious. Your photos of this divine treat are lovely. Wow, Yvette, it is sooooo pretty!! Now THAT is an awesome Pink Saturday treat. Wow. Jaw dropping awesome. Wonder what it tastes like and how fun to make. Details. Details. Details. And, I recognized your blog theme right away, since I blog on WordPress (my preference) and have the same theme. 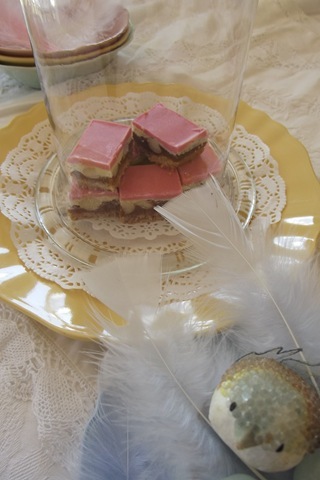 My Pink Saturday post is on the Google version of my blog. I’m debating which one to use to sign off with here. Hm. I think I’ll go with WP, just cuz. 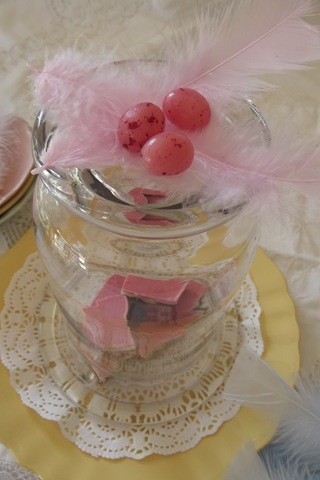 You won’t find my Pink Saturday wording on the WP blog though, but the same post generally. I’m curious what else is on your blog. Interesting blog title too. That caught my eye as soon as your blog opened. Happy Pink Saturday. These look absolutely wonderful and so pretty!!! Looks delicious! Thank you for sharing the recipe!